I've just been adopted by a wonderful family! I had been adopted, but just returned on 9/18/09. My humans were not prepared for how much work it takes to live with a bunny. Plus, they turned out to be sort of flaky. I only like my food to be flaky, not my people. If you can provide me with a stable, loving and fun indoor home and make a commitment to care for me for the rest of my life (probably 7+ years), please visit me soon! My name is Donald. 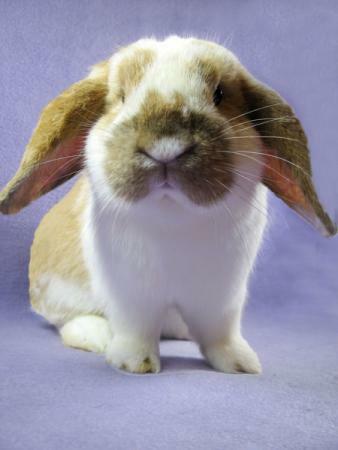 I am one very handsome and classy, neutered Holland lop boy. Just look at my golden locks and long plush ears. No "comb over" for me. No sir...Mine is the real deal. Very classy. I am a fun, outgoing guy with a busy agenda and full day planned. Have "your people call my people" and we'll set up a meeting to see if you can be my apprentice and prove to me you know how to treasure a rabbit! Be Classy and Watch My Video!